In the near future, all companies have to be equipped with adaptable business models, strategy maps, process and application landscapes in order to stay competitive, innovate and to be future-proof. Today, start-ups and fast-moving competitors are rising and you have to make sure that you will not be outclassed, outperformed or put out of business. With interactive digital overviews of the current and future state of your adaptable business, you will be able to always respond quickly to changes in and outside your company. This is exactly what Dragon1 provides you with. In this whitepaper we first discuss how visualizing your business helps to control change and transformation. We then show how the Dragon1 Enterprise Architecture Method provides an approach for the waterfall and the agile world. Lastly, we show how Dragon1, the SaaS platform for visual enterprise architecture, provides an integrated solution that supports you in all the strategy, architecture and transformation work that needs to be done. And it pays off. Do you want to move forward with your company? Then read this white paper. 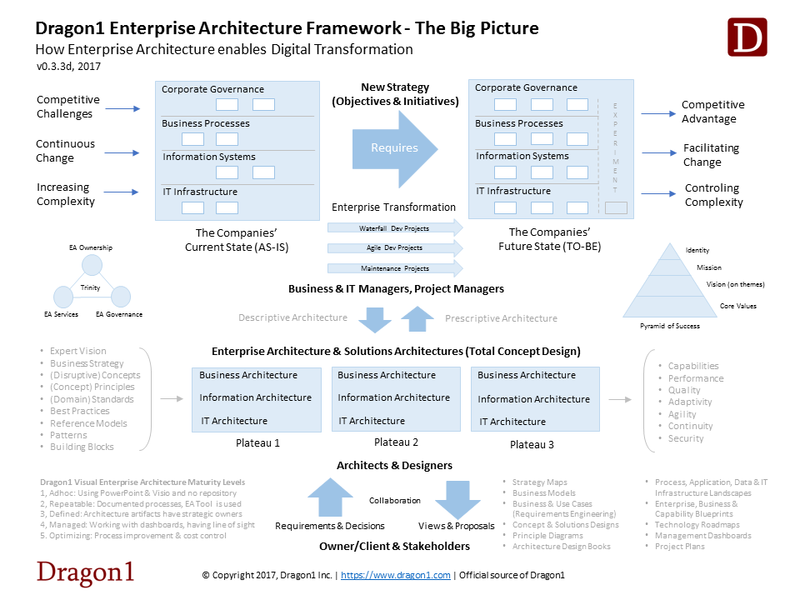 Why Visualize Your Business using Enterprise Architecture? Every company in the world is confronted with changes and transformations. They are happening and taking place every day. New technology, new customer demands, enforced rules and regulations all require companies to respond rapidly with innovation. Business Processes and Information Systems need to be replaced, updated and integrated. To make sure that the companies’ processes and systems do not form one big knot and they do not come to a standstill, companies make use of Enterprise Architecture. Complexity is also rapidly increasing: every company stores more and more data and wants to be smarter learning from that data and use it. Also, the company is becoming more and more digital and virtual. Everything has to be very flexible. For instance, yesterdays’ mass products are today's’ unique products driven customer demand. To be able to deal with the complexity, to control it and maybe even reduce it, companies make use of Enterprise Architecture. With Enterprise Architecture, every stakeholder of a transformation gets visualizations about his or her concerns, with views of the transformation. He or she can make the necessary meaningful decisions on time and give directions to the projects executing this transformation. The participants of the projects get specific visualizations they use to design, build and implement enterprise-wide solutions to overcome their concerns. Why use the Dragon1 Enterprise Architecture Method? Dragon1 is both an open Enterprise Architecture Method and a SaaS platform for Visual Enterprise Architecture (Dragon1, The Business Visualizer). If a company decides to work with Enterprise Architecture, Dragon1 supports and enables working with Enterprise Architecture at a strategic level and in a visual manner. Dragon1 makes sure that architects use the strategies and business models of a company as context for their architectural design (concepts, principles, standards, building blocks and patterns they choose). Every architecture and enterprise wide solution that is designed, build and implemented in this way, will always be aligned with all the entities in the organization. Dragon1 also makes sure that every stakeholder is always involved at the right time for an initiative, transformation, program or project. At every stage for different types of stakeholder Dragon1 defines what types of views on matters and visualizations (diagrams) for stakeholders have to be produced. Stakeholders understand the visualization they are looking at and use it to support their decision-making process. Dragon1 as a method describes a new approach to look at enterprises because it makes use of the newest insights and theory on architecture principles. Where the current mainstream frameworks and modeling languages for enterprise architecture focus on the logical and physical level of abstraction, Dragon1 also focusses on the conceptual level of architecture. Dragon1 is the only architecture method to define all of its core terms in a consistent way: clear distinctions, no circular reasoning, used terms in definitions are also defined and no gaps between terms. For instance: Architecture is defined as a total concept for a system or a structure. Architecture principle is defined as the enforced way concepts (made part of an architecture) work and produces results. A concept is defined as an abstract system consisting of collaborating elements. Dragon1 as open EA Method, with its checklist, templates, reference models, glossary and processes ensures that you can work with Enterprise Architecture in a successful and practical way. Without any overhead and focused on what is necessary to enable and support enterprise transformation, every project in your company will be a success.